$12 98 postpaid, air-mailed first class, anywhere in the world! from his mother while learning to play. wrong way, and the Columbus way! 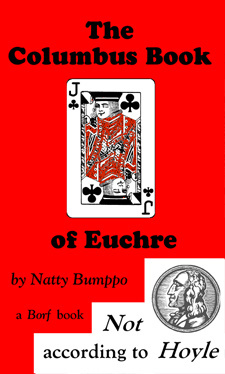 “Order The Columbus Book of Euchre now! What’s a “Missouri loner ”? It’s not just a bumper sticker; it’s a scoreboard! in your order that that’s what you want. The new global price is $12.98 – period (U.S. dollars). Postage included. Same for everyone – Columbus to Canberra. The price is slightly higher on Amazon.com, to cover the cost of their bar codes; and Amazon.com will nickel-and-dime you for shipping and handling, too. We won’t. A proposed sanction for exposing your hand – an infraction previously unaddressed in The Columbus Book of Euchre, and virtually unaddressed in all “Hoyle” encyclopedias – was added August 5, 2003. Two new sections were added to The Columbus Book of Euchre on July 5, 2003 – “End play” and “Finesse” – along with three new definitions: of “end play,” “finesse” and “tenace,” along with a footnote on the definition of “renege” (explaining why the proper term is “revoke”). The section on, and definitions of, “doubling” and “redoubling” have been removed. Not many players “double” or “redouble” at euchre these days. The second edition of The Columbus Book of Euchre (1999, ISBN 0960489460) is a continuation of the 72-page book published in 1982, which was the first book published strictly on euchre since 1905. The new edition has new terms, new ploys, old rules, old axioms, better typography, better color, and 90 pages, with index, reviews of other books on euchre, and a section on computer euchre. Natty Bumppo gives euchre lessons in real games on line, most Sunday mornings (times vary, and he will even wait until Sunday afternoon for devout churchgoers). The cost is $20 per session. Prepayment and registration are required. You may mail check or money order (payable to Borf Books) to register, or you may pay by PayPal (please use our home page if paying by PayPal). Every tutorial session will last at least two games or one hour, whichever is longer. Registration will be limited to three persons per session, but "alternates" (registrants beyond first three) may kibitz and will be invited to join if registrants fail to appear or bail out. This edition of The Columbus Book of Euchre is a complete desktop publication – composed, printed and bound in our small offices in Brownsville, Kentucky. One reviewer of another of our desktop books – although he gave it five stars – referred to the printing as “home made,” and the cover as made of “construction paper.” You can call it “home made,” or you can call it “hand crafted”: Whichever, we have found a way to publish – economically in a limited edition – a book high in demand, but not in a mass market. And because it is not printed in bulk – a typical press run is four copies, and printing runs only slightly ahead of purchase orders – slight additions and corrections can appear in later printings. And any buyer who feels shorted by an earlier printing can get a free update – on line (by clicking New Appendix) – or hard copy by mail, as explained in the back of the book. And the cover is not made of “construction paper”: It’s 80-lb. red vellum, which costs us more than $40 a ream. It’s not “slick,” but it’s a stock of higher quality than used in the binding of many mass market paperbacks. The winner is he who can go it alone! For he knew, like the earth, he could go it alone! For he felt in his heart he could go it alone! That his crutches have left him to go it alone! Unless you’ve the courage to go it alone! Let this be your motto: Rely on yourself!